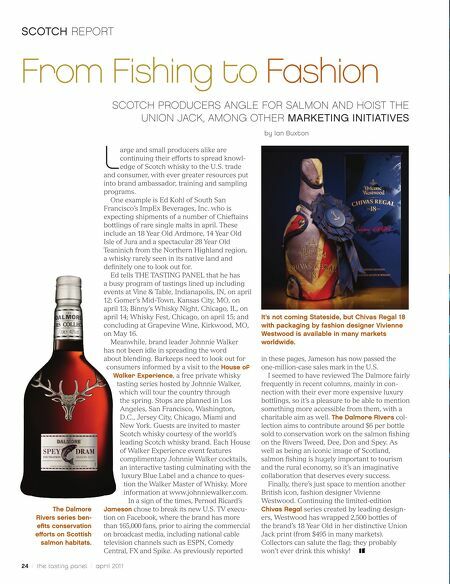 SCOTCH REPORT From Fishing to Fashion SCOTCH PRODUCERS ANGLE FOR SALMON AND HOIST THE UNION JACK, AMONG OTHER MARKETING INITIATIVES by Ian Buxton and consumer, with ever greater resources put into brand ambassador, training and sampling programs. L One example is Ed Kohl of South San Francisco’s ImpEx Beverages, Inc. who is expecting shipments of a number of Chieftains bottlings of rare single malts in april. These include an 18 Year Old Ardmore, 14 Year Old Isle of Jura and a spectacular 28 Year Old Teaninich from the Northern Highland region, a whisky rarely seen in its native land and definitely one to look out for. Ed tells THE TASTING PANEL that he has a busy program of tastings lined up including events at Vine & Table, Indianapolis, IN, on april 12; Gomer’s Mid-Town, Kansas City, MO, on april 13; Binny’s Whisky Night, Chicago, IL, on april 14; Whisky Fest, Chicago, on april 15; and concluding at Grapevine Wine, Kirkwood, MO, on May 16. 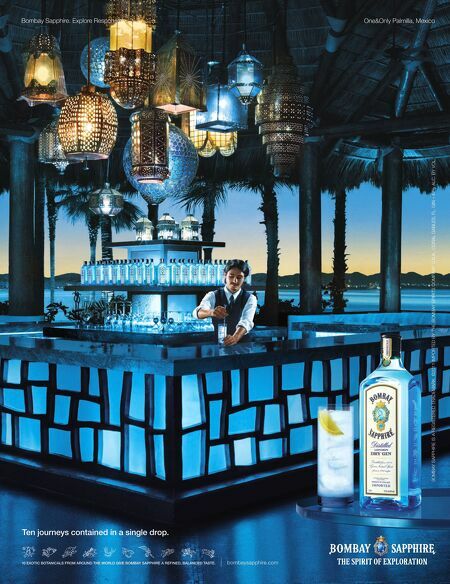 Meanwhile, brand leader Johnnie Walker has not been idle in spreading the word about blending. Barkeeps need to look out for consumers informed by a visit to the House of Walker Experience, a free private whisky tasting series hosted by Johnnie Walker, which will tour the country through the spring. Stops are planned in Los Angeles, San Francisco, Washington, D.C., Jersey City, Chicago, Miami and New York. Guests are invited to master Scotch whisky courtesy of the world’s leading Scotch whisky brand. Each House of Walker Experience event features complimentary Johnnie Walker cocktails, an interactive tasting culminating with the luxury Blue Label and a chance to ques- tion the Walker Master of Whisky. More information at www.johnniewalker.com. In a sign of the times, Pernod Ricard’s The Dalmore Rivers series ben- efits conservation efforts on Scottish salmon habitats. Jameson chose to break its new U.S. TV execu- tion on Facebook, where the brand has more than 165,000 fans, prior to airing the commercial on broadcast media, including national cable television channels such as ESPN, Comedy Central, FX and Spike. As previously reported 24 / the tasting panel / april 201 1 arge and small producers alike are continuing their efforts to spread knowl- edge of Scotch whisky to the U.S. trade It’s not coming Stateside, but Chivas Regal 18 with packaging by fashion designer Vivienne Westwood is available in many markets worldwide. in these pages, Jameson has now passed the one-million-case sales mark in the U.S. I seemed to have reviewed The Dalmore fairly frequently in recent columns, mainly in con- nection with their ever more expensive luxury bottlings, so it’s a pleasure to be able to mention something more accessible from them, with a charitable aim as well. The Dalmore Rivers col- lection aims to contribute around $6 per bottle sold to conservation work on the salmon fishing on the Rivers Tweed, Dee, Don and Spey. As well as being an iconic image of Scotland, salmon fishing is hugely important to tourism and the rural economy, so it’s an imaginative collaboration that deserves every success. Finally, there’s just space to mention another British icon, fashion designer Vivienne Westwood. Continuing the limited-edition Chivas Regal series created by leading design- ers, Westwood has wrapped 2,500 bottles of the brand’s 18 Year Old in her distinctive Union Jack print (from $495 in many markets). Collectors can salute the flag; they probably won’t ever drink this whisky!